Roland Emmerich. He’s the big-budget director of “Independence Day,” “Universal Soldier” and “Eight-Legged Freaks.” I came across an article on Emmerich and his design aesthetic in the New York Times’ August 7, 2008 Home section. 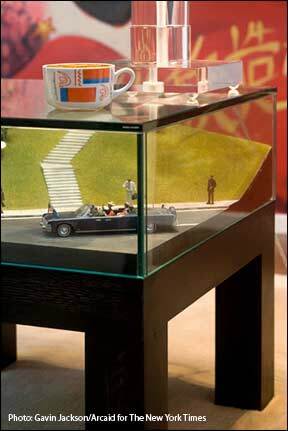 But what about the miniaturized diorama tables in the living room? The ones that Emmerich commissioned from his movie prop department. The ones that depict, in the Times’ words, “notorious events”? There’s a tiny diorama of actor Hugh Grant propositioning a prostitute. Clever, right? I guess it’s good for a laugh. And a miniature scene of JFK’s assassination. Look! The “grassy knoll”! It’s right there, under the Modernist coffee mug placed, just so, for the NY Times photographer to capture. Then there’s the Tienanmen Square showdown between tank and student. Wow! That’s clever! Don’t forget the diorama that depicts “scenes of torture at Abu Ghraib prison in Iraq.” (NY Times) I guess human rights abuses, political assassinations and torture are equally as decorative and collectible as Hugh Grant’s tabloid-driven humiliation. Oh, come on! Don’t get all outraged! The politics of history, the history of politics, the spectacle of celebrity, the news as spectacle… they’re just a bunch of shiny baubles available to anyone with money! It’s the design within reach of a callous few. Politics and abusive governments are just another scenario. History isn’t real. It really doesn’t mean anything! Look! Look at the Times photo of a laser-cut steel chair that Emmerich placed in his garden terrace. The one made by underage workers, uh, children, in Ghana. They’re made from rusted Shell oil drums! They have laser-cut inscriptions on them, like “insurgents” and “infidels.” Don’t they look great next to the aqua blue skylights? I hope the New York Times does another article when Emmerich adds a Darfur diorama to his collection. It would be soooooo cool to see miniature depictions of women and children fleeing from the Janjaweed! bestest’ over and over again. very annoying – worthy of the designers miniature trophy poopies. angry white man misanthrophy for four more EARS. mcain only offers the ‘tried’ and failed. over and over again. Emmerich, i do not envy the man’s karma. is that kinda like no spiritual health insurance? free Tibet and Detroit, now!